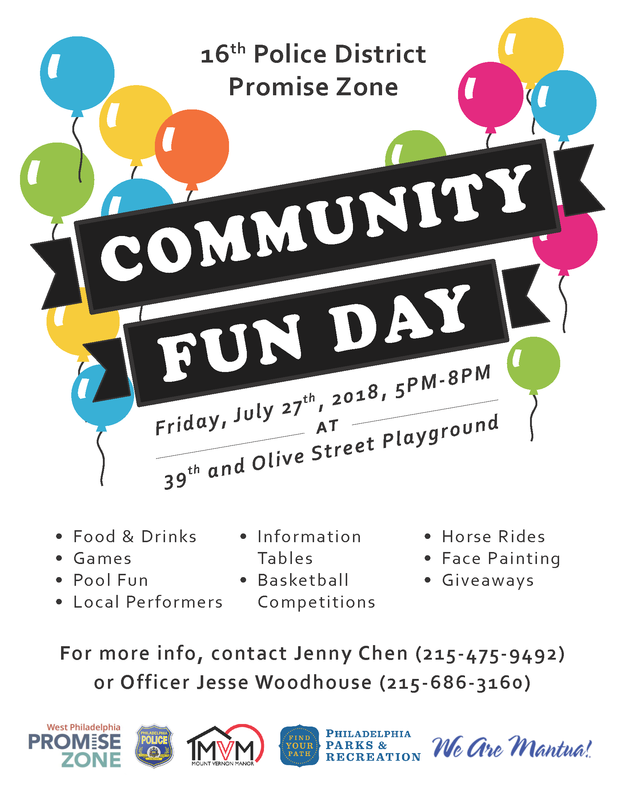 Join your friends, neighbors, and family members for the 16th Police District Promise Zone Community Fun Day on Friday, July 27, 5-8PM at 39th and Olive Street Playground. The event will feature local youth performances, a fitness demo by Community Relations Officer Woodhouse, an appearance by Ms. Philadelphia, and over 40 resource tables from local organizations! In addition, there will be a youth/police basketball game, face-painting, horseback-riding, jump-roping, and lots of pool fun. All activities and food will be FREE. Previous Previous: June 16 – Health Is Wealth Community Workshop!